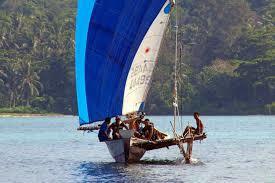 A cruise in Papua New Guinean waters has been for many people the highlight of their world cruise. Situated in the centre of the Asia-Pacific region, surrounded by the Coral, Bismarck and Solomon Seas, whose constant movements feed and enrich the marine environment, PNG has twice as many marine species as the waters of the Red Sea and an estimated 10 times as many as the Caribbean. Its diving has been rated the Top Dive Destination in the World in Rodale’s Scuba Diving Readers Choice Awards. The best time for diving is during the dry season, which starts around April/ May and runs until early December. The best cruising in Papua New Guinea is found among the many islands to the east of the main island, where islanders still live a peaceful life and sail large traditional canoes for fishing and trading voyages. New Caledonia is the French Overseas Territory of Nouvelle Calédonie. The main island is the mountainous Grande Terre, 250 miles (400 km) long and 30 miles (48 km) wide. Grande Terre boasts one of the largest insular coral reefs in the world, and one can sail around much of the island inside the reef.